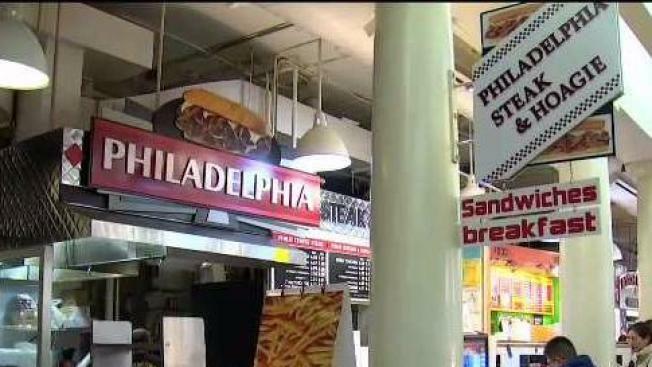 With many Philadelphia-related items banned from the Esplanade in Boston, including cream cheese and pretzels, some Philly businesses are responding in-turn. Don't let the name of his business fool you, Bob Gesek, owner of Philly Pretzel Factory, knows who he will be rooting for come Super Bowl Sunday. "I'm definitely going for the Pats, but the Philly fans, they're die-hards," Gesek said Tuesday. Gesek, who spent more than two decades in Philadelphia, says his pretzels are popular with both fan bases, even with a football showdown looming. "They are as passionate about their football team as we are here up here, and that is what it makes it so great," he said. Meanwhile, In Faneuil Hall, Farid Nuri is working hard at Philadelphia Steak & Hoagie. "Obviously, I'm for the Pats," he said. "Some people they say, ah you make Philly cheese steak in Boston?" Nuri's stand is bustling on Tuesday night. "People, they say, ah, you're Philly, I say I'm sorry I'm going for the Pats," he said. Not to be outdone, Dottie's Donuts in Philadelphia is also getting in on the act. "We are not doing any Boston cremes, no New England theme donuts, until after the Super Bowl," Quinton Johnson said. The doughnut shop taking a hit to profits in the name of fan loyalty. At Dotties' Boston creme doughnuts is a best seller. Back in Boston, the Esplanade Association, which runs the Charles River Esplanade, hits back. "We banned a series of Philadelphia related items," Michael Nicholas, Executive Director of the Esplanade Association, said Tuesday. "I think the Superbowl seems to bring Boston together." "Believe it or not, we actually had a Falcons Fan and a Giants fan on staff that put the policy together in support of our hometown team," he added.